This was my very first WiFi in Animal Crossing ever! It was with Teru (linking to her Wild World blog, since that’s what’s relevant to this post, but she’s also the owner of the New Leaf blog, Lily of the Valley) in her gorgeous town Bundeena! 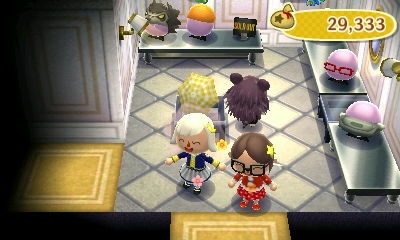 Here we are together in her mush room, which I’ve always liked because of the assortment of items mixed in with it, that still seem to match well with the room regardless! And this was Choco’s first trip to Dafdilly, I believe! I’ve always liked this picture of us looking out into the ocean in the rain. Setting off sparklers in my first “party” in Dafdilly — hence the silly party hats. xP From left to right in this picture it’s Jemma, Teru, and myself. Choco was on the far left, and unfortunately cut out of my picture. This was a later WiFi in Bundeena (as shown by the Autumn trees), but I thought I’d include it after the previous picture because I love this picture for the same reason — our pretty dresses and crowns (Choco and I this time) matching the beauty of this spot! This is Choco’s Flower Paradise island in StarCity, filled with hybrids! 😀 I always loved visiting her island, it was so beautifully decorated! ❤ Later on she even added a fountain and little park. I love the misty blue sky in this picture, it seems like such a peaceful atmosphere. Choco and I bed-bumping, always fun. 😛 I like how we have the same expression at the same moment. Net fight in StarCity! This was actually when Jemma first arrived to join the party, so our greeting for her was a welcoming net whack. 😛 I remember Choco even had a “battle arena” set up for the net fight, a ring of trees! Choco, me, and Teru showing off some pretty umbrella designs in an Autumn visit to my town 🙂 I like how the trees seem to be framing us. Usagi, Jemma, and I having a picnic together in Jemma’s town usa, taking a little rest after playing many fun games during her spring-themed party! 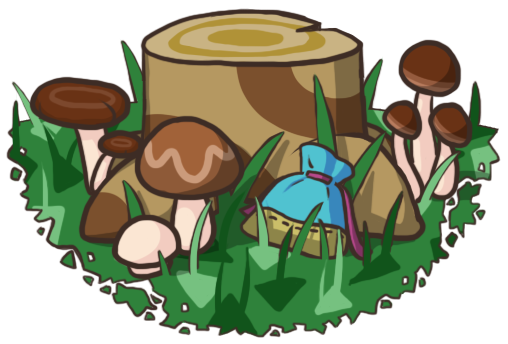 😀 Jemma has several cute picnic spots in her town, along with pretty flowery paths and lots of orchards! Liam visiting Dafdilly! 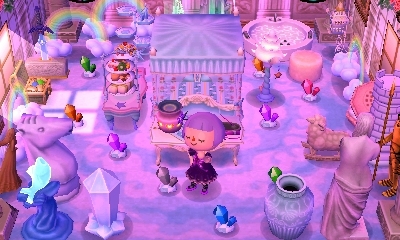 Had my town all done up in a candy theme. The two of us enjoying the calming atmosphere by Whitney’s private beach, with the lovely 8 PM music playing. Setting off sparklers with Petite D during my visit to her town Bentley! I always loved reading her blog so it was such a treat to visit and see everything and everyone in person. Posted on May 25, 2014 by Amy •	This entry was posted in AC:WW, AC:WW WiFi and tagged Animal Crossing. Bookmark the permalink. Ooh, that would be exciting! 🙂 Well I myself would definitely enjoy reading your posts, whatever game they’re on! And you might be surprised, I think sometimes seeing content from AC:WW can be interesting for people since AC:NL content is so prevalent. But AC:NL is of course great to post about too, and easier because of the in-game screenshots, and a lot easier to WiFi with! Once you’re on your Dashboard, you’ll see many menus on the left side of the page, and one of them is called “Appearance” which is how you can edit your theme, background, header, widgets (the boxes on your sidebar, like where I have my list of ACWW and ACNL posts), etc.! Awesome, good luck with it! 🙂 Look forward to seeing what you do! Awww, Amy this made me tear up! I can’t believe we’ve known each other for years, yet it feels like just a month or so. I loved all of these pictures, definitely brought back some memories! It’s strange to say all this time later, but I doubt I would have ever gotten into Wild World if I hadn’t stumbled across your blog a few Summers ago (even if my playtime was often limited) so although I cannot fully appreciate the shutdown I’m definitely going to miss our Wild World and City Folk WiFis! Ahh these brought back memories x3 I read this post during the week while going out on uni prac but wasn’t able to sit down and write a reply >__< It's so nice seeing all these lovely pictures of parties and everyone's towns again, ones that I'd visited as well as ones I read about in your blog, and being reminded of the impressive and beautiful decorations that your town was decked out in on different occasions. Here's to more great memories to come! I think part of what seems special about the AC:WW WiFi memories surrounding the wordpress community is all the “parties” we had with the games set up and such, I don’t know if that many AC players went to such lengths as we did in setting those up xP And the parties seem like a bit of a past-time now, because in New Leaf landscaping is too much of a focus to completely re-do my town for a party (like with PWPs, which would be too expensive to demolish and rebuild; and bushes, which are hard to collect; and with the BT Ordinance, which allows widespread flowers). But I think the island tours help fill the void of the old games and such we used to do! 🙂 I know not everyone likes them, though. I agree! ❤ Other games just don't compare to the appeal of Animal Crossing for me, and the special memories and friends it's added to my life! Ooooh, it’s so awesome that that’s become an actual possibility now xD Can’t wait! WiFi services for all DS games were discontinued so that Nintendo could push their consumer base to buy the 3DS and play the games for it. Plus it costs them money to keep the WiFi servers running. Last I heard, though, there’s a project somewhere online that is trying to run their own WiFi service so that people can continue playing DS games online.